The essence of trading decision-making is the knowledge of market direction move probability. All traders, especially the predictor players having overnight positions need to know in advance what can be the expected market direction in a certain market situation. Yes, the predicted Daily, Weekly and Monthy direction might give us a cluse, but many other classical analysis might also support our decision making. In this study we take a closer look at this, analysing the recent market activity which consist of data during the past year or so, from March 31, 2011 till April 27, 2012 about 13 month, having a range market behavior first and uptrending period during the last 3 – 4 month. We analyse the NASDAQ100 ETF (Symbol "QQQ") as an example, but similar clonclusions could be achieved by analyzing other ETF-s, like the S&P500 ETF, the SPY for example. In this 1A shows that relative to the prevous day’s closing level, which is denoted by a black line, pointing to the right, we have 9 different possibilities. Out of these nine possibilities we eliminated three to get to the 1B picture. 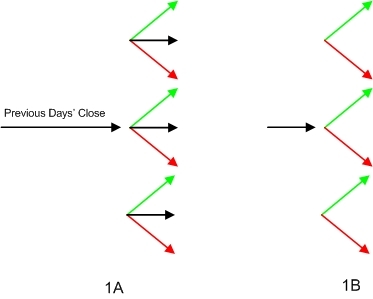 The arrows demonstrate the direction of the market day, where the end of a specific arrow denotes the end of day or closing level, and the beginning of the arrow denotes the opening level for the day. So If the market opens with a Gap Up (The Gap defined here as the Open minus the previous day’s close) which is greater than 0.3 [%], (In our example study) than during the day it can still go in two different directions. If the closing level is Greater than or equal to the opening level, than it is showed with Green line, if the closing level is below the market opening level, than it is showed with a red line. If the market opens with a Gap Down (Which means that the difference between the current day’s open and previous day’s close is greater than 0.3 [%], (In our example study) than during the day it can still go in two different directions. If the closing level is Greater than or equal to the opening level, than it is showed as Green line, if the closing level is below the market opening level, than it is showed as a red line. So what do we know based on the above picture? These are the less important probability information as the market behavior might change. This tells us, that assuming we have a Gap up (greater tan 0.3 [%]), than at the market open we have a 79.68 [%] probability, that the market will close up above the opening level, and 20.32 [%] probability that it will close below the opening level. This alone a very good probability to play a Long that day, and be very cautious trying to play an intraday short on that day, as a daytrade. Looking at the down GAP is even more surpizing. If the market opens down by more than 0.3 [%] Today from the previous day's closing level, than we have a 86.31 [%] probability, that the market will go down even more the same day, and will close below the opening level. But at the same time opening a Short position at the market open when the Gap Down is greater or equal to -0.3 [%] and keeping the short position till the market close result a profit with 86.31 [%] probability, which alone might be good idea to play. But having an overnight Long position in this situation might suggest us to close as soon as possible, as the probabilities are against us, if we wait untill the market close. Of course the number of intraday market swings can be numerous (usually between 1 – 5 on the 5 Minutes chart, and we considered here only the closing and opening levels. 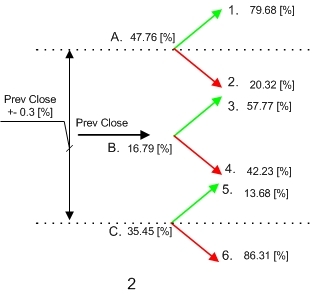 But overall we can conclude that in Today’s market type if the market Gaps up by more than 0.3 [%], than it usually closes even higher, above the opening level, and conversely if the market opens down by more than 0.3 [%], than we have a high probability that it will close down even below the opening level. What can be the reasons of these asymetric probabilities? I leave it to the user to find the evidence. This probability data suggest relatively small number of days with meaningful intraday reversals. The US stock market probably experiences less intraday reversals than the European market, due to intermarket relationships. Many studies could be created to discover and utilize this situation. As an example assume that you opened a Long position the previous night at the market close after getting Bullish Daily and Bullish Omega predictions, and Today the market opens down -0.5 [%], or more than -0.3 [%] that we used in our study. What will be the most probable action Today for our Daytrader, having that position? 1. Selling and closing the Long position by a loss? 2. Selling or closing the Long position by a loss and soon after look to open a Short position? 3. Opening another Long position at lower prices to averaging down? 4. Stay put and do nothing during the first 30 – 60 minutes? 6. None of the above, you prefer a different strategy to play this situation? No matter what you select, this situation described above, when you have an overnight position and the market Gaps against your position with a meaningful Gap is the most difficult situation to play to make a net profit on that day. - Because the probabilities are Not on your side if you just try to close that single Long position. - Because the importance of the market behavior during the first 5 – 30 - 60 minutes is extremely important in this case and only experienced traders can select the most benefitial strategy consistently in similar situations, which is really stressful as it might require quick direction changes and very quick reaction to market activity. - So it is probably clear from the above that the best strategy, as always highly depend on actual market behavior, but in this situation the strategy might involve more steps, might involve intraday reversal plays and most probably the overall success of the day depends highly on timing and quick reaction, which could be achieved only after certain experience. Hopefully this „MAP” of probabilities, presented in this study will help to generate new ideas and to manage your overnight positions, opened as a result of daily prediction data. This should be viewed in the context of your knowledge about predictor performance, your trading experience and knowledge of expected market behavior during different situations.